“Leaving the mad weather behind I’ve now being able to settle into a good eating, sleeping and strategy making routine – thanks to these stable conditions. The latest routing shows it will take around 10 days to get to Guadeloupe from where we are now, currently between the Azores and Madeira. “The good news is that today the new Lombard Lift Veedol rocket-ship is now going slightly slower than me for the first time in the race! 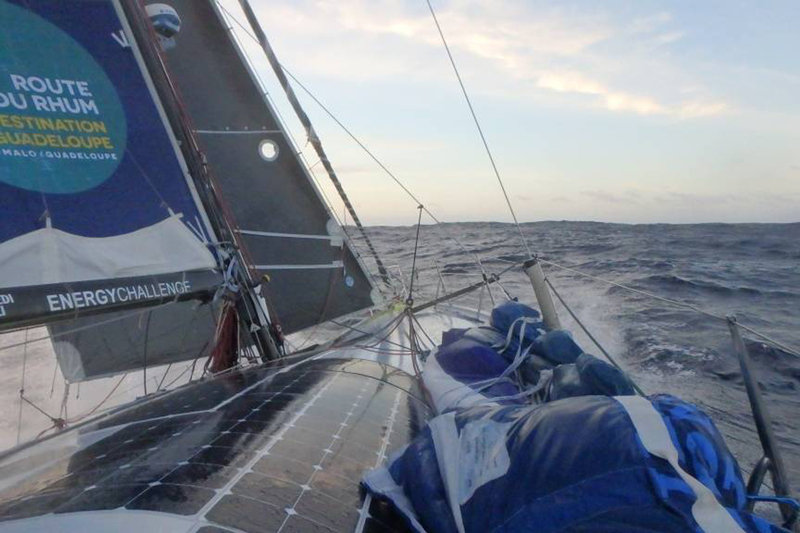 He could well be in lighter winds at the moment, but it’s a relief to see that the boat can actually sail at less than 10 knots… I have a lot of work to do to catch up, but I’m hungry for it! “Taking a step back, I am relieved to be where we are now and satisfied to be standing strong after such a wild time since Sunday. Last night was a clear sky and we were sailing towards the bright starts of Orion, a good sign that we are heading south into warmer and more stable airs – Phil”.